Today I am writing from my sofa, after my first day of lectures yesterday and a busy weekend I am enjoying my day off by staying in my Pj’s, tucking up on the sofa with a big squishy duvet, and occasionally trying to play and Need For Speed and Skyrim! I’m still really in my first week at university and we haven’t got past all the introductions to things yet. It means that although we aren’t really doing that much – I’m really really tired! I’m putting it down to getting used to my new schedule and the amount of new information I’m trying to take in. I’m loving the library at my uni and I had my first Molecular Biochemistry lecture yesterday and I think I’m going to really enjoy that. 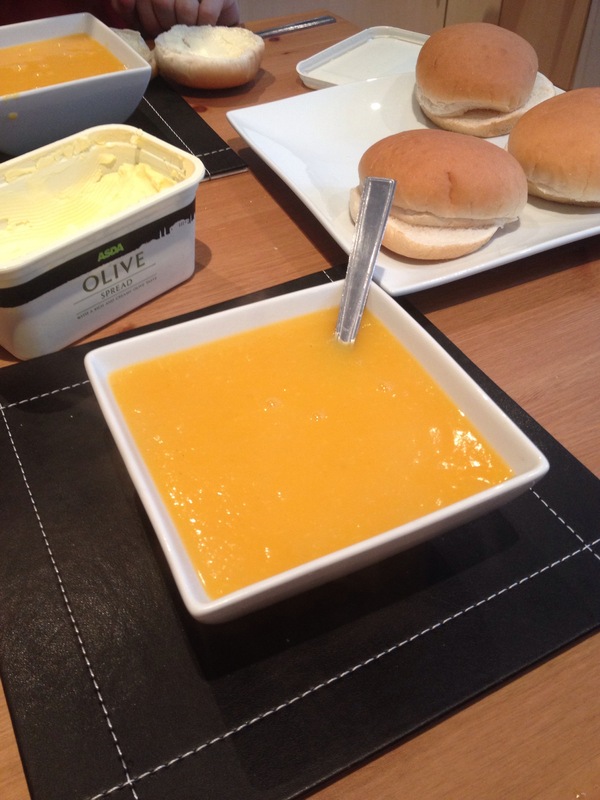 This morning I decided that what I really wanted for lunch today was some warm, comforting soup and despite what the weather has been doing this week (crazy hot and sunny!) it’s actually supposed to be nearly autumn. And what food is great in autumn? Squash! Unfortunately as much as I love butternut squash thats literally all I can find in the shops, unlike in America where they have lots of different varieties.. If anyone knows where you can buy spaghetti squash in the UK I will very much be in your debt! Soup is so easy to make. I just put all these ingredients in a saucepan, heated it right up so it’s bubbling then turn it down to a simmer for about half an hour to make sure everything was nice and soft! I then used a hand blender to whizz it all up! You can leave it chunkier if you like but I think this soup is better velvety and smooth. Soups are really easy to make but I find its better to try and get vegetables that go together, don’t get me wrong you can chuck in whatever veggies you have but when you match flavours together you just get a nicer taste 😀 Another top tip is to take out some of the broth before you blitz it up then you get a thicker soup or you can add cream to it for a really yummy finish!